As we mentioned in our post, earlier today, Dr. Babar Awan is visiting various Telecom and IT organizations (as part of ministerial round), and for this he today visited PTA head office. We are expecting him to visit NTC, R&D and other places in coming days. A statement issued by PTA said that during his visit Dr. Awan emphasized on the need of pro-consumer telecom policies, which should be revised every year. Just for the records, it merits mentioning here that most of our telecom policies (IT Policy, Broadband Policy, Telecom policy) have got expired and are bound to be revised, since 2009. This means government needs to renew policies now (with 5 years expirations date), let alone their yearly renewal. PTA’s Statement said that Chairman PTA Dr. Muhammed Yaseen, Secretary Law, Mr. Muhammad Masood Chishti, Member Finance, Syed Nasrul Karim Ghaznavi, and Member Technical, Dr. Khawar Siddique Khokhar and senior officers of the Authority were also present during the visit. Complaint handling system should be made effective and all service providers should make arrangements to remove grievances of the consumers. The minister stressed that awareness campaigns should be launched in Urdu and regional languages. “Grey trafficking is a serious issue and it needs to be dealt effectively, in this context laws may also be thoroughly checked and applied”, the Minister emphasized. He said that telecom sector in Pakistan has made decisive contribution towards the national economy therefore challenges faced by the telecom sector are being addressed in an appropriate manner. The Minister said that for the prompt disposal of telecom related cases, Telecom Tribunals would be set up soon. He also stressed the need for coming up with out of box ideas for implementation of ongoing activities regarding the development of telecom sector. The Federal Minister offered PTA, his full support, for smooth access of telecom services to the people of Pakistan residing in the far-flung areas. 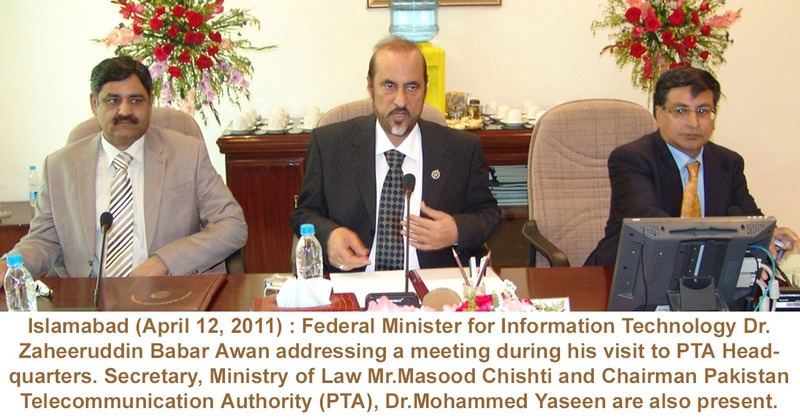 He appreciated the role of PTA in the uplift of telecom sector. During the visit, Chairman PTA briefed the Minister about the latest developments taking place in the telecom industry. Chairman said that Pakistan telecom industry was growing at an astounding pace after the deregulation of the sector. The broadband sector growth has been extraordinary and this sector has become a model for other countries across the world. He said that number of factors have played role in it, including investor friendly government policies and healthy competition introduced by PTA which has encouraged operators to an extra mile for making a strong subscriber base. On this occasion Chairman PTA Dr. Muhammad Yaseen presented souvenir to honorable Minister.